I’d love to do a lot of things. Turn invisible, teleport, travel back in time… you know, the usual stuff everyone would want to do when they’re asked what kind of super powers they’d like to have. Given that I read old history text books for fun when I was younger (concentrating on the prehistoric and medieval eras), it’s no surprise that if I could travel back in time I’d make two stops. One would be to see the knights in action, and one would be to see the extinct wonders of the natural world, like the dunkleosteus up there. As I browed through Discovery’s image gallery, some of these critters just looked like, even in their time, they were fighting an uphill battle to survive. I mean, just given the size of some of these leviathans means they’d have to be eating constantly to keep going. 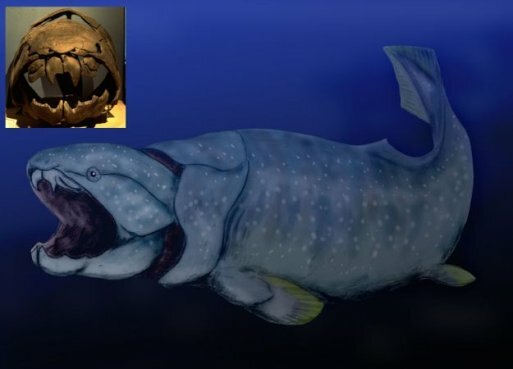 I guess if elephants can do it on land and blue whales can do it today, dunkleosteus could have done it in ancient oceans.